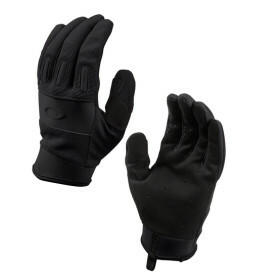 Oakley SI Lightweight Glove (Black) » Protective Solutions, Inc. The Oakley SI LIGHTWEIGHT GLOVE is mission-specific gear, designed for operations that require low weight with proven performance. Breathability is essential for warmer climates, so this glove combines span nylon with AirpreneÆ for maximum comfort. Oakley utilizes AX suede to maintain dexterity at the palms, and the reinforced trigger finger is removable for easy adaptation. A high-friction pattern on the fingers provides a sure grip. Airprene joint panels - Engineered for added breathability, Airprene is utilized in joint panels to improve fit and flexibility. This enhances both comfort and freedom of movement. Breathability - Special textiles and construction techniques enhance breathability to improve comfort by reducing the buildup of moisture and heat. The resulting micro-environment is less favorable to bacterial growth, so breathability helps reduce odor. Most sizes in stock. Also available in Foliage Green.